Do you want to make your very own cookie bouquets? Give a Homemade Gift Basket to Dad on Father’s Day! Father’s Day cookie bouquets are an unique way to let your father how much you care about him. They also make great birthday gifts for men, especially when they are themed ones. Finding gifts for men is always somewhat challenging so you should try to learn what your father does really like before choosing a present. Does he like sweet treats ? Then take advantage of the many different themed Father’s Day cookie bouquets available in stores to give him a present that will love. Cookie bouquets are unique luscious and sweet gifts to give your loved ones. These bouquets made out of cookies of different shapes and decorated so as to look like actual items (golf balls, baseball balls, golf clubs, tennis rackets, etc.) make unique edible gifts to get a loved one. Patriotic Cookie BouquetCheck PricePerfect Father’s Day cookie bouquet for your US army father. Is there a better way to show your admiration and support to your loving Dad than by giving a marvelous star shaped bouquet of sweet treats? This cookie bouquet is without the shadow of a doubt let him know that, for you, he’s the greatest stars and stripes bearer ever. This cookie bloom arrangement is made out of tasty red, white and blue star shaped cookies. You can choose to have 5, 7, 9 or 12 of these adorable edible gifts in a bouquet. In addition, you are provided with an option for entirely customizing the cookies. They are definitely the kind of presents that will provide their recipient with the most agreeable surprise effect. Bon Voyage! Cookie BouquetCheck PriceIdeal Father’s Day cookie bouquets for a retiring persons. If your loving Dad is retiring these days, then you may want to give him a lovely cookie arrangement that relates to this very important step in his life. This bunch of sweets can also be the compliment of a travel certificate. It may also be given to your father just before he’s going on vacation. The arrangement includes colorful beach balloons, flip flop sandals ideal for a dolce farniente on the beach or the back yard. Some sun shaped cookies add to the vacation or sunny destination feel and a cookie plaque that you can customize with the message that best fits with your father’s new occupation is included in the bouquet — yes you can have the message of your choice written on the message cookie. Super Stars Cookie Bouquet- 9 Pc Bouquet If your Dad’s your very own superstar, as much admired as a movie star, then let him know. 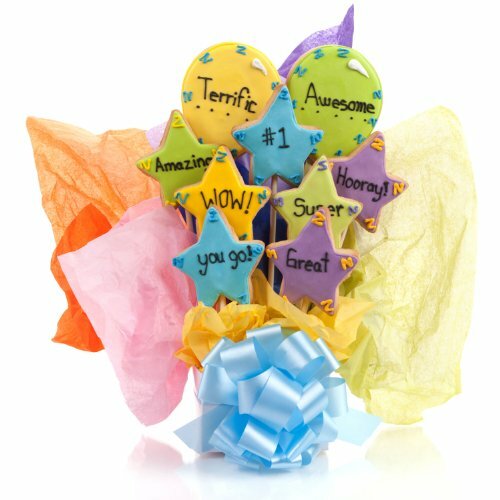 This can be done through the gift of a superstar sweet arrangement that consists in colorful star shaped cookies on which some compliments are written. From “wow” to “hooray”, from “terrific” to “awesome”, Father’s Day is the ideal time in the year to tell your father how much you care for him. Make sure to add a personalized message to the bouquet. Biscuits are always a delicious present to make and more often than not enoyed by their recipient. This deligthful bunch of cookies includes 9 star shaped sweet treats. You’ll Bounce BackCheck PriceBecause it comes with a basket ball, a baseball ball, a football ball, a tennis ball along with a center plaque on which you can have a personal message written, this bouquet of sweets is going to please a sports amateur. Just like all other arrangements, this one can include more than 5 items – actually you can order up to 12 of these decorated biscuits. It is made out of vanilla sugar cookies, made by hand and fresh from the oven. The icing designs turn them into life-like sports balls and that is what makes these bouquets so fantastic. The beauty of these sweet edible gifts is that the cookie message can be customized in the way you want. This enlarges the range of Father’s Day cookie bouquets you are going to choose from. Whether you didn’t find the kind of cookies that would please your recipient or just want to create your very own themed bouquet, then why don’t you take cake decorating classes. Craftsy.com provides you with a wide range of classes that will teach you how to create stunning crafts. They even have classes that will teach you how to become a cookie designer. This way you’ll be able to create a stunning bouquet for Father’s Day. The kind of bouquet that will make others want to learn or… buy from you. Tagged baking cookies, buying cookies, cookie blooms arrangement, edible father's day gifts, father's day cookie bouquets, father's day gift ideas, father's day treats, sport cookies, stars cookies.